Structured especially for K5 through 3rd grade, our Day Camp program provides a day packed full of games, Bible teaching, and outdoor fun for kids not quite ready to spend a night away from home. From 9 am to 5 pm, campers are supervised by our staff of counselors as they participate in a variety of activities on campus (with plenty of breaks inside our air-conditioned facilities!). All campers get to go home at the end of the day! Price is $150 and includes five full days, lunch, a t-shirt, a water bottle, a backpack, and Dropbox access to the week's photos. Rising 6th-8th graders experience five days filled with sound Bible teaching, topical biblical seminars, choose-your own electives, canoeing, nature hikes, and more. Campers benefit from the one-on-one attention of our college-aged staff in rustic cabins and personal, interactive teaching. 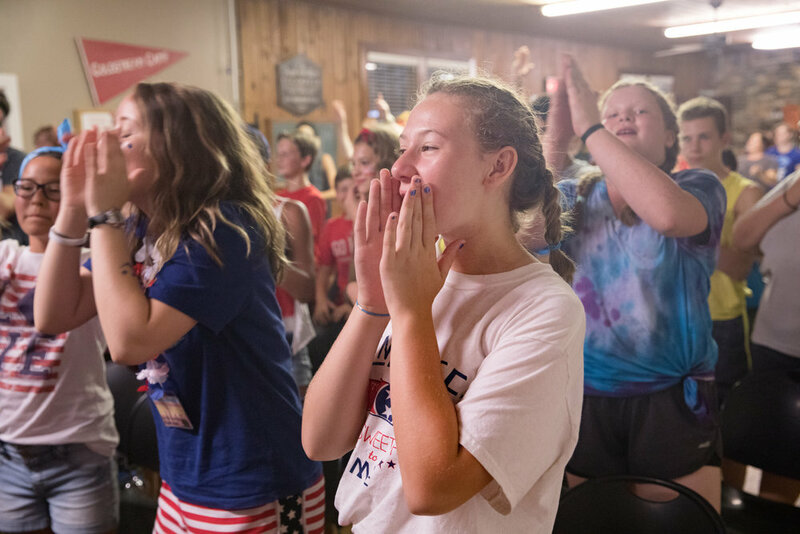 The quiet backdrop of rural Tennessee sets the tone for campers to grow in the knowledge of their faith, relationships with friends, and their personal relationship with God. Price is $250 and includes all meals, a t-shirt, a water bottle, a backpack, and Dropbox access to the week's photos. This overnight camp built for rising 3rd-5th graders combines the perfect amount of structure and flexibility as campers attend topical biblical seminars, participate in electives such as theater and hiking, and enjoy the beauty of God's great outdoors. Campers live in cabins of 6-12 other campers with our CPR and first-aid certified staff. Our High School Camp provides rising 9th-12th graders with five days packed with customized elective programs, topical Bible seminars, rock climbing, laser tag, hands-on nature studies, and more. Under the supervision of our college staff, campers are shaped into more holistic, informed followers of Christ while experiencing the beauty of rural Tennessee. Price is $275 and includes all meals, a t-shirt, a water bottle, a backpack, and Dropbox access to the week's photos. Spend a Day at Camp!